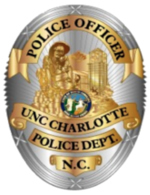 UNC Charlotte Police & Public Safety currently maintains over 300 campus Blue Light emergency phones monitored by tele-communicators 24/7/365. Blue Light emergency phones are placed strategically throughout the campus providing the University community an easy and reliable way to report a crime, describe a crime in progress or utilize the UNC Charlotte SAFERIDE program. These phones are designed for ease in operation consisting of a single red button (on most phones) designated “PRESS FOR HELP” and a single speaker/microphone used for hands free communication.